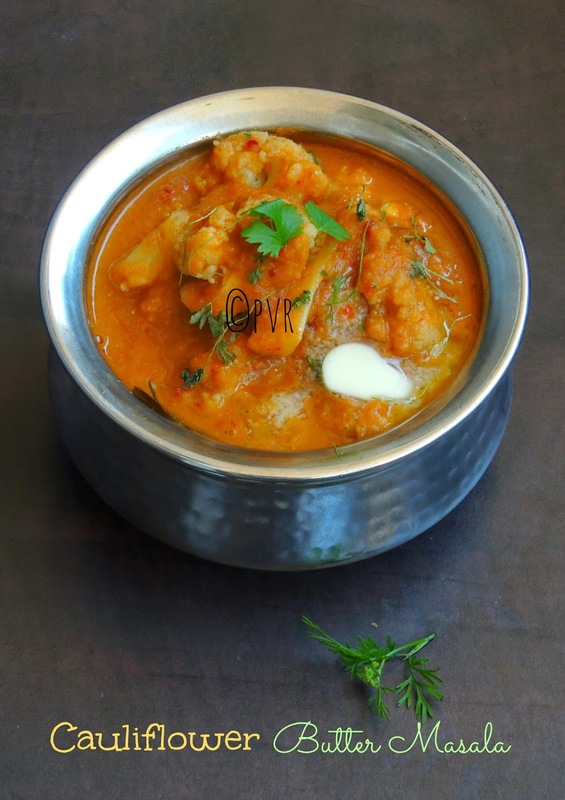 Whoever love paneer will definitely love Paneer butter masala, and whoever love cauliflower will definitely love this lipsmacking gobi paneer masala. Yes trust me this gobi paneer masala is absolutely fingerlicking if you serve them simply with rotis or naan. Actually i never thought to making out this much rich looking gravy with cauliflower earlier. While going through Pari's space, i got hooked to this cauliflower butter masala and i tried it at home two days back for our dinner. Trust me, my lil one who loves cauliflower in fritters enjoyed thoroughly this gobi butter masala. Obviously this dish is approved by everyone at home. Cauliflower this annual plant produced by seeds contains sulfarophane,a sulfur compound has been shown to kill cancer stem cells for slowing tumor growth.Cauliflower contains recommended daily value of vitamin C,its also a good source of vitamin K, protein, thiamin, magnesium, vitamin B6. Cauliflower is an extremely versatile vegetable, you can eat it raw, steamed, or else by cooking with spices or just simply by baking. Cauliflower contains antioxidants, obviously its really adviced to add this vegetable often in your diet. 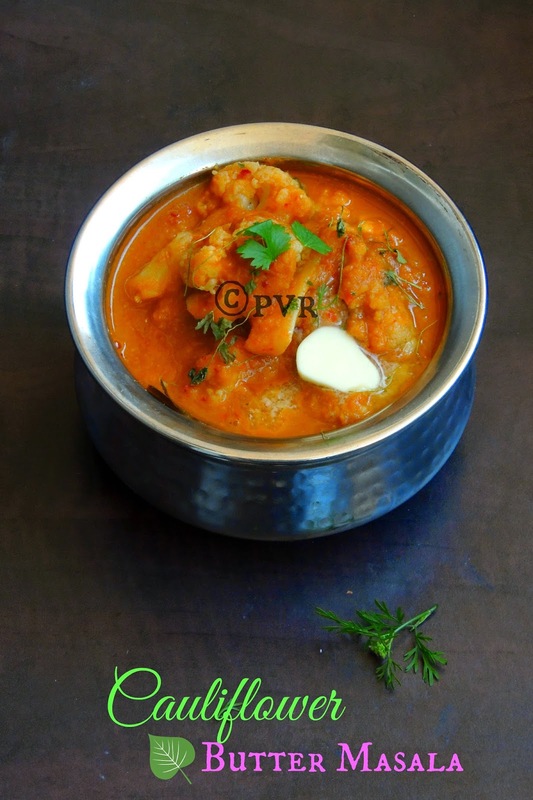 Now coming to this lipsmacking gravy, it takes hardly less time to get cooked and cauliflower cooked in onion-tomato based gravy tastes fabulous with mild spiciness and bit crunchiness. Cook the onions, tomatoes, kashmiri red chilies, ginger and garlic in enough water until they turns soft. Boil the cauliflower in water along with some salt and lemon juice till half cooked. Dry roast the whole spices in the pan, then put the butter in the pan. Once the whole spices are fried,add the ground paste and saute for about 2-3 mins. Now add the coriander powder, cumin pwder, salt to taste and sugar. Once the oil separates from the gravy, drop the cauliflower and mix thoroughly. Pour water and adjust the consistency of the gravy. Bring to boil, cover and cook, crush the roasted kasuri methi gently with fingers. Once the cauliflower is done, add the kasuri methi, garam masala and cream. Mix thoroughly, cook for few minutes before removing from the flame. Remove all the whole spices. Garnish with some fresh cream or butter. Serve with rotis or naans. Who can resist by seeing this super inviting cauliflower dish........yummy! Inviting and tasty looking cauliflower masala. Wonderful pic. oh my god!!! love it love it. I am usually at loss when it comes to cauliflower, that gravy looks ..... divine!! My favourite veggie..Such an exotic gravy Priya..Slurp ! Wow..your pics are making me damn hungry..truly irresistible gobimasala...Love it! perfect for rice or roti..
Curry looks delicious, perfect with some phulkas..
Would love to gulp it along with a couple of hot rotis!! Fantastic preparation! So flavorful and yum! sounds gr8,perfect side dish for naan!! Uffff, that looks so tempting Priya!! Beautiful masala Priya! I will definitely try it! Thanks for trying my recipe and I'm glad that ur family enjoyed it. Thanks for linking. Tempting curry dear....... Looks creamy and yummy! This is looking really yummy, I will try. It is looking yummy, good idea to eat cauliflower, I will try. looks yummy, I will try. good idea of introducing this veg in a new way.